Vanackerite: Mineral information, data and localities. For Georges Vanacker (1923-1992) a Belgian systematic collector. Cd-substituted, trigonal derivative of mimetite. Calculated mean refractive index is 2.04. 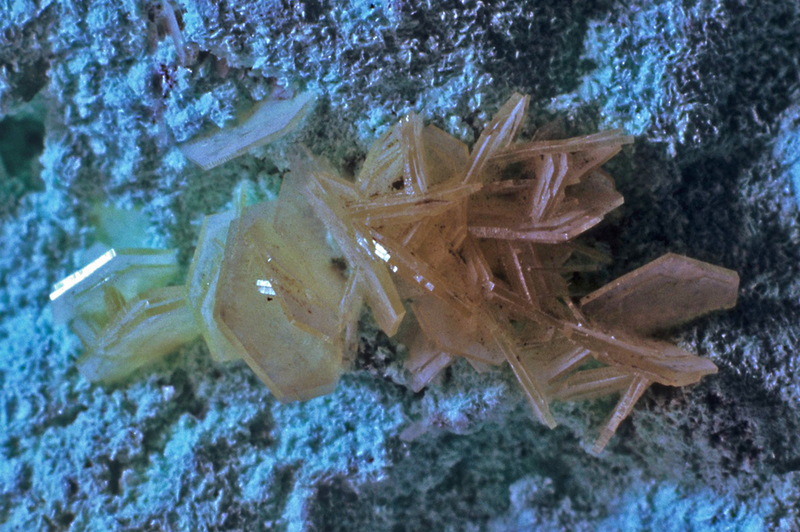 Rosettes of thin pseudohexagonal tabular crystals up to 5 mm. Light yellow rosettes of thin pseudohexagonal tabular crystals up to 5 mm in size on bluish green thometzekite. Schlüter, J., Malcherek, T., Gebhard, G. (2012) Vanackerite, IMA 2011-114. CNMNC Newsletter No. 13, June 2012, page 812; Mineralogical Magazine, 76, 807-817. Schlüter, J., Malcherek, T. & Gebhard, G. (2016): Vanackerite, a new lead cadmium arsenate of the apatite supergroup from Tsumeb, Namibia. Neues Jahrbuch für Mineralogie - Abhandlungen: Journal of Mineralogy and Geochemistry 193, 79-86. Schlüter, J., Malcherek, T., Gebhard, G. (2012) Vanackerite, IMA 2011-114. CNMNC Newsletter No. 13, June 2012, page 812; Mineralogical Magazine, 76, 807-817.; Schlüter, J., Malcherek, T. & Gebhard, G. (2016): Vanackerite, a new lead cadmium arsenate of the apatite supergroup from Tsumeb, Namibia. Neues Jahrbuch für Mineralogie - Abhandlungen: Journal of Mineralogy and Geochemistry 193, 79-86.